There’s always a disconnect between the way a city is portrayed on screen and the day-to-day reality of its existence. New York isn’t actually surly taxi drivers and whistling construction workers; you can’t see the Eiffel Tower from every street in Paris. But Venice is the exception. There is nowhere else like it. 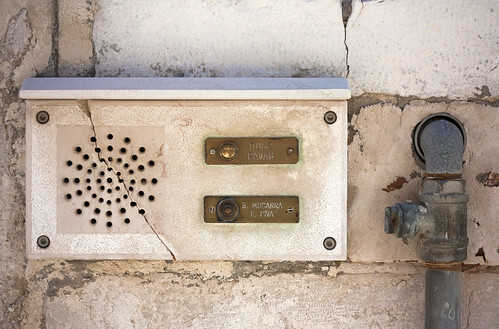 What’s more, it never changes, at least in the physical sense, except to gain a few more layers of patina, a few more cracks in the bricks of its foundations, the water of the canals lapping a little bit higher with every passing year. The evening I arrived in Venice, after taking shelter from a momentous thunderstorm, I walked along a canal in Cannaregio, past polished wood motorboats and old women watching from the windows, and thought: is this place for real? Of course, even if the Venice of our imaginations coincides uncannily with the Venice of real life, there is far more to it than meets the eye. The biggest surprise was how few tourists stray from the beaten path. 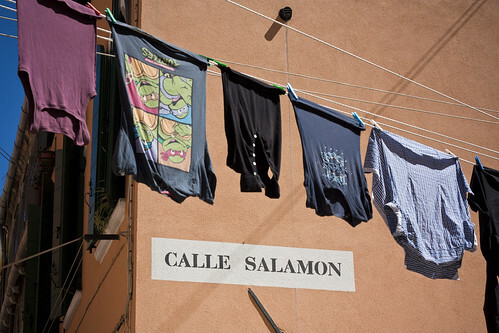 Here is a place with a small and dwindling population, where visitors far outnumber locals, and it never takes long to venture into a quiet street where kids are playing soccer and some old timers are taking their first spritz of the day. One evening, walking through Santa Croce, I stumbled across a neighbourhood block party sponsored by the local Communist Party. Hundreds of people — families, mostly — sat on long wood tables, munching on fried seafood and zucchini flowers while they drank beer from plastic cups. A few tourists wandered by, looking a bit mystified, before opening their maps and wandering away. 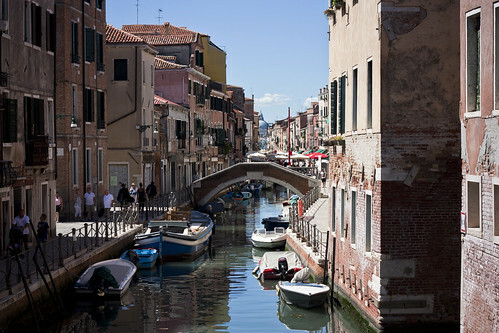 You can’t be rushed in Venice. Unless you own a motorboat, the fastest way to get around is to walk — it takes less than an hour to walk from one end of the city to the other, and about the same time if you go by water bus. Many streets are silent but for the sound of sloshing canal water and footsteps. It takes awhile to get used to the pace, but once you do, it’s hard to go back to normal life. 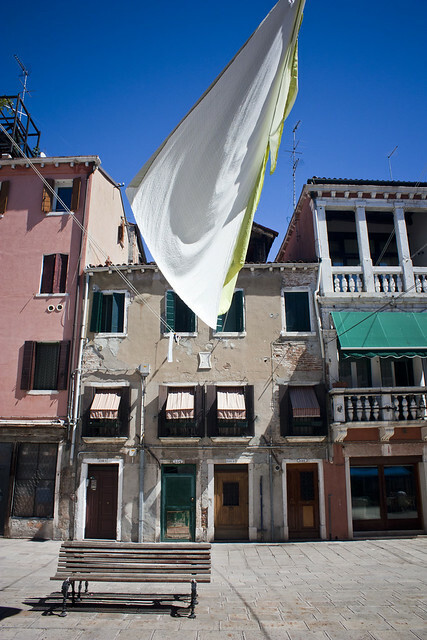 The places that seem to best embody the Venetian spirit are the bacari, a kind of tavern where locals flock for aperitivi throughout the day. They stand in a crowd outside the bar, sipping on white wine and bitter cocktails while munching on cicchetti — little bits of seafood, meat or vegetables served on bread or polenta. It’s equivalent in spirit to Montreal’s cinq à sept, but even livelier and more informal. The best cicchetti I had were at Timon, where customers sit cross-legged on a boat hat has been converted into a makeshift terrace. Sitting at Timon made me think of all that small details of Venetian life that make it such a beguiling place, in spite of the tourist crowds and threat of decline. Here are a few I enjoyed. 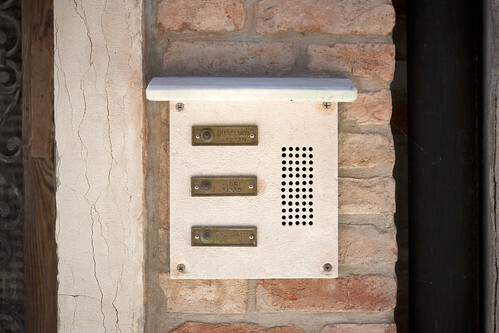 A friend once swore that Urbanphoto would eventually turn into a blog about urban doorknobs, and this certainly takes it one step closer. 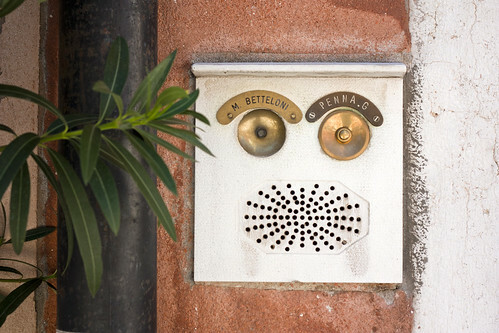 Virtually all of the apartment building buzzers in Venice share a similar aesthetic, but each has different detailing. Many look like robot heads. 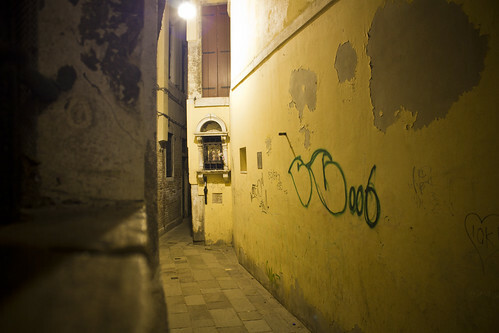 Venice is labyrinthine, but I didn’t expect a maze to have such well-marked streets and squares. 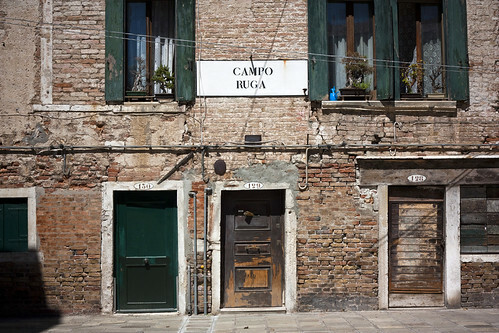 Venice’s street signs are painted onto the sides of buildings. They are huge. 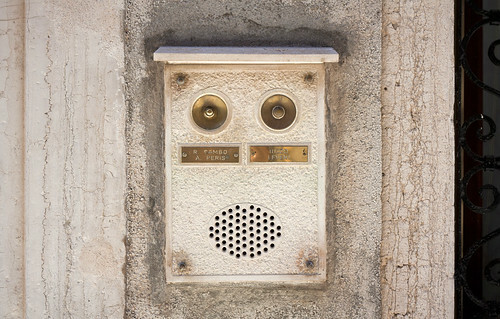 They are also one of the most visible reminders that Venice has a language of its own: calle is the local word for street, whereas via is used elsewhere in Italy. 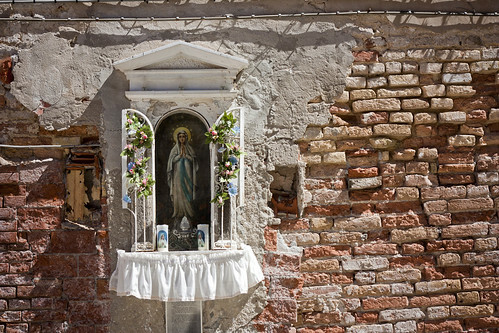 Shrines to the Virgin Mary are hardly surprising in a Catholic society, but in Venice they are remarkable in their consistency and ubiquity: on nearly every street there is a wooden altar with candles and a portrait or figurine. They reminded me of the Chinese altars found throughout the more traditional Chinese world. 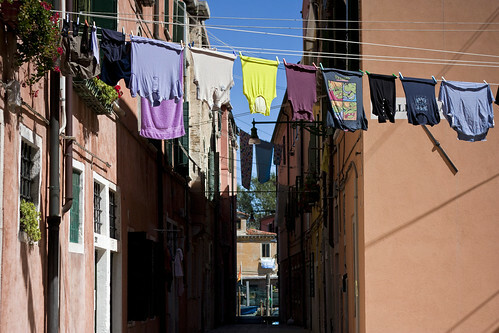 The sight of laundry hanging over a narrow street is so stereotypically Venetian you forget that it’s actually a sign of life — underwear drying on the line means the tourists haven’t taken over yet. 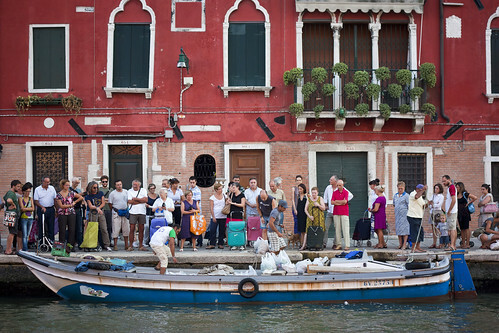 Tourists and a lack of road access mean everything in Venice is more expensive than on the mainland — so neighbours band together to avoid the local markets. People cruise around in their cars, pop music blasting over the stereo, so naturally they do the same in boats. Evening brings with it the dulcet tones of Italian hip hop. 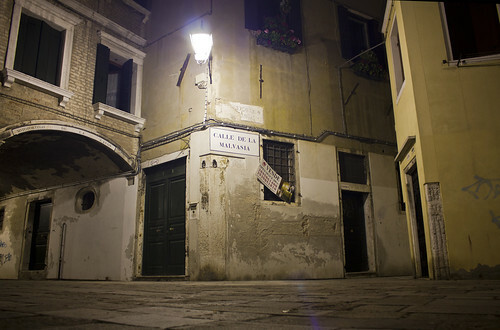 This entry was written by Christopher DeWolf , posted on Thursday September 13 2012at 10:09 pm , filed under Art and Design, Europe, Heritage and Preservation, Public Space, Society and Culture and tagged Altars, Clotheslines, Exploring the City, Italy, Street Furniture, Street Signs, Streetlife, Venice . Bookmark the permalink . Post a comment below or leave a trackback: Trackback URL. Thank you for this little dive into Venezia. I’ve never been, but it’s in the plans. You say few tourists wander away from the major attraction sites. It is actually true of every place. I was in Tuscany last spring, and it was just the same. But I think it is ok that way, it gives a chance to the smaller streets and parts of towns to breathe freely and remain truer. We know how “overvisited” places can turn into a burden instead of an exciting experience, even for the traveler itself. Just like you, I truly like to depart from the common paths. Speak a bit of the language, try their food, respect and use their customs (would it be just saying hello when you come into their shops) : I meet people happy to serve me, willing to be patient and helpful when I order, and sometimes speak my language, give me insider tips about their towns and places. I see it as a very little effort in respecting those I visit, in comparison to how truly rewarding it is in return. Thank you for the pictures and the words. And I wish you more happy trips like this, as many as you wish. Thanks! Hope you can make the trip soon. What I could see, is that the human imagination has no limists. 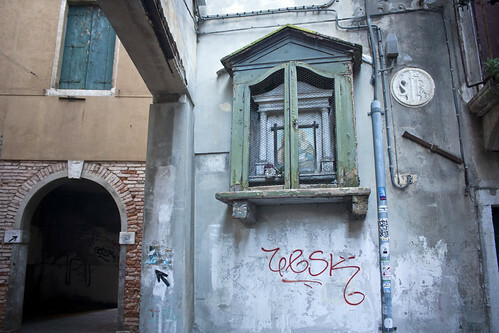 Venice is the best example that we can make art in poor places, I´m not saying Venice is a poor city, but the aspect loosk like a South America city. I could see also that the enviroment make people. 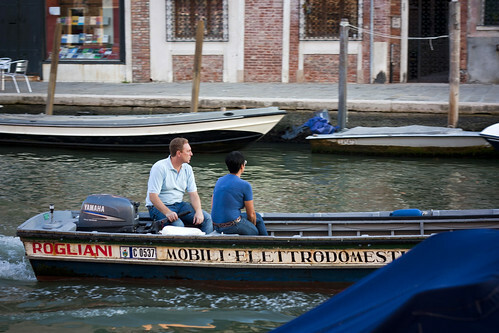 They enjoy Venice because of the show you can see when you are there. won’t sound like the venetian word. Why not Cicheti. This is how it’s spelled in venetian, this is not an italian word and it should reflect its origin. Honestly, I had to pick a spelling and I went with the most commonly-used one.